I get that: I haven’t lived in my home for even a year and I’ve already rearranged my glass-front cabinets twice. 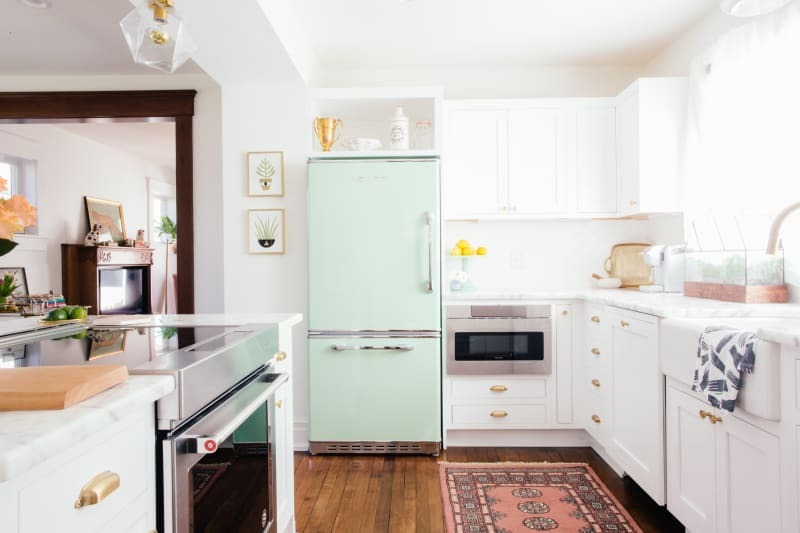 But whether you’re a renter who can’t make changes, or you’re short on money or time, doing a full kitchen renovation (even a small one) might not be in the cards. Luckily, that doesn’t mean you’re stuck with what you’ve got. 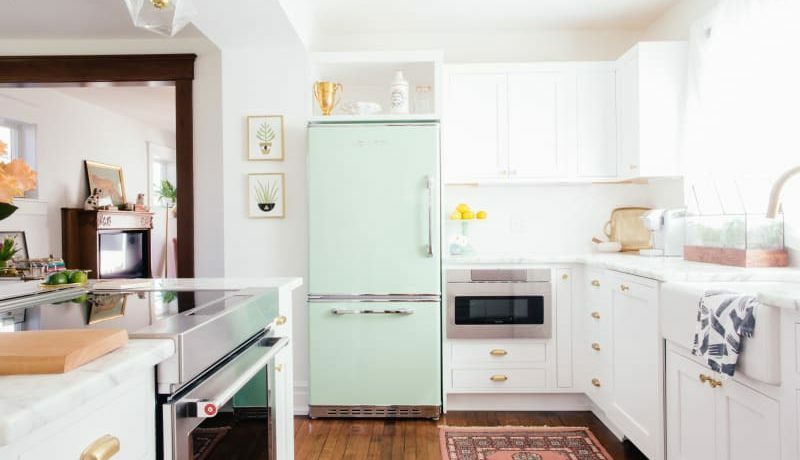 Here are nine little ways to upgrade your kitchen without renovating. 1. Line the backs of cabinets. Since I’ve already confessed to rearranging my glass-front cabinets, I’ll tell you my next goal: to cover the backs with adhesive wallpaper so that my pitchers and salad bowls pop against a peppy background. (I’m eyeing this spirited Lemon Fresh print from Chasing paper, which is $40 per roll.) It’s an easy way to freshen up a color or add a print without doing a whole wall. 2. DIY custom drawer dividers. Another project on my list: to make wooden drawer dividers for all my drawers. Having dividers that actually make sense for the utensils in there gives the interiors of your drawers a luxurious, custom feel. New hardware might be your biggest bang for your buck. Trading out your existing plain round builder-grade knobs (I say, as I look at my own) for ones in an up-to-date metallic tone like brass or rose gold, or ones with an interesting shape, can give even a small kitchen some character. Plus, if you’re a renter you can pop back in the old knobs when you move and use your new ones for a dresser drawer or another project. Pro tip: You can easily get sucked in and spend too much money on these, so aim to spend less than $10 per piece. Featureless cabinet fronts are not for everyone. To give a plain cabinet door some character, consider affixing molding to the front. You can get simple wood stripes or various shapes and lengths of molding at the hardware store, or consider more decorative pre-cut panels from O’verlays, which has styles from fretwork to Chinoiserie. If you’ve got an island, or a breakfast nook with metal or wooden chairs, consider changing up the color. All you need is a little bit of paint (read the label to make sure it’s the right product for your task) and you can change basic honey-colored wood into something that better matches the scheme in your kitchen. 6. Stick on a backsplash. If your backsplash is blah drywall, upgrade it with adhesive tile panels. There are a few companies that make great some great options and they all effortlessly peel and stick to your wall — no messy grout work necessary. One of my favorites? Tic Tac Tiles, which has everything from classic white subway tiles to bold patterns and colorful mosaics. Smart Tiles is another good one. You can shop both brands at Home Depot. As I write this, it’s a gray evening and downright dim in my kitchen. I wish I had a little light here on my countertop! Even if you don’t work in your kitchen, under-cabinet lights can brighten a small space and create ambiance for a cocktail party. Lamps Plus and Home Depot have a bunch of plug-in and battery-operated options (read: no dealing with electrical installations), from adhesive puck lights to LED strips and narrow bars. A good rug can do two things for a dated kitchen: Add a bit of much-needed color and hide an ugly floor. I suggest getting a flat-weave rug (like a kilim rug) so that it’s easy to clean. And the busier the pattern, the better, as it’ll help hide stains and splatters.